Former populist President Mahmoud Ahmadinejad announces his intention to run for president in the May 2017 presidential elections. Photo by Mohammad Ali Marizad for Tasnim News Agency, which publishes photos with the rights to be redistributed. The Iranian elections are almost a month away, scheduled for 19 May 2017. However, 11 April marked a significant day — official registration for candidates opened, and more than a hundred candidates have already thrown their hats into the ring. Two high-profile candidates have risen above the fray to steal the media's focus: Ebrahim Raisi, the figure expected to succeed Ayatollah Khamenei as Supreme Leader, Iran's most important religious and political figure; and Mahmoud Ahmadinejad, the country's controversial former president. Registration will last for five days, followed by a period of time when the registrants will be screened for their political and Islamic qualifications by the hardline and religious body tasked with vetting, the Guardian Council . The council is typically responsible for disqualifying the majority of registrants for making it to the final candidates list. Prior to 11 April, momentum has been building as to who the final candidates will be. Persian social media erupted on 6 April when Raisi — the favourite candidate to replace the Supreme Leader, Ayatollah Khamenei — announced his intention to run for president. Reactions of worry were quick to spread, as Raisi is an influential cleric with a close relationship with Khamenei. He will pose a significant challenge to the reelection of popular moderate President Hassan Rouhani. In the name of God, I have got election stress. Conditions for moderates have now deteriorated. In the history of the Islamic Republic, which has held 11 presidential elections, there has never been an instance where a sitting president has not served for two terms. However, many believe this election will be one of the most significant in the regime's history, as it's a period many expect to see the aging and ailing Supreme Leader's passing. The last time a Supreme Leader was elected was upon the death of the founder and first Supreme Leader of the Islamic Republic, Ayatollah Khomeini. During that time, the Assembly of Experts chose Seyyed Ali Khamenei, the sitting president, to replace him, motivated by the knowledge that he was a particular favourite of the deceased Khomeini. Earlier this week, President Rouhani held a press conference where he skirted questions about his plans to run for a second term. While not discussing his participation in the forthcoming election, his press conference did seem like an early form of campaigning. Rouhani spent the majority of the conference defending his record on helping improve conditions for poor Iranians and the benefits that the country's has experienced from his efforts to lift international sanctions. With a Raisi-Rouhani match-up, the election was already shaping up to be tense. Then, on April 12 ex-President Ahmadinejad threw a curve ball into the race with his announcement that he intends to run. Ahmadinjead is most notable for being the president whose reelection was tainted by irregularities, which in turn sparked the Green Movement of 2009, which saw hundreds of thousands of Iranians take the streets in protest. In September 2016, Ahmadinejad announced he would not join the race, after being warned by the Supreme Leader that his candidacy would cause polarization and harmful divisions in Iranian society. 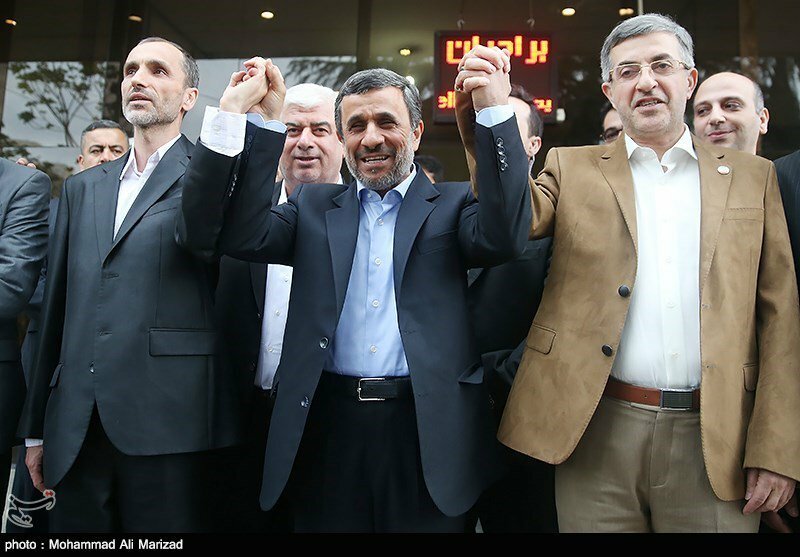 While also banned in 2013 from running for reelection, Ahmadinejad campaigned for the election of his former chief of staff, Esfandiar Rahim Mashaei. Mashaei, however, was not able to make it past the Guardian Council‘s vetting of the final list of presidential candidates. Ahmadinejad's former vice president, Hamid Baghaei, also registered his candidacy, and some theorize that the two are running in an effort to increase their election odds, as there's speculation that Ahmadinejad won't make it past the Guardian Council's vetting.